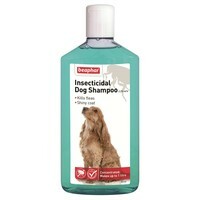 Beaphar Insecticidal Dog Shampoo 250ml is a concentrated formula to use on dogs from the age of 12 weeks and over. This fantastic shampoo effectively kills all fleas in your dog’s coat, to leave a clean and glossy, pest-free coat. This is a concentrated shampoo formula and needs to be diluted before use. Please read all instructions carefully before use.